Many years ago, a very prominent libertarian stood before the microphones on Parliament Hill in Ottawa to announce that, "the government that governs least, governs best." Much has been written over a period of many decades by many credible authors about the harm that governments cause by meddling in, controlling, interfering in and managing various sectors of the economy. Are we about to enjoy, at long last, a government that governs less? The recent election of a Conservative majority government in Ottawa has raised concerns among some about the future of the marketing agency known as the Canadian Wheat Board. The wheat board was originally conceived as a short-term measure to help struggling western farmers survive the drought of the dust-bowl years, as well as to ensure that England would have access to affordable Canadian wheat during and after WW2. But decades after its inception, the short-term measure still exists. Western farmers are literally compelled by force of law to sell their wheat to the wheat board, which in turn sells the wheat to overseas markets. Farmers who privately marketed their wheat would face fines and jail sentences. Several western farmers have responded to changing weather patterns and changing markets by growing different crops, including a variety of beans and lentils. They have been able to market their produce to domestic and overseas markets without the involvement of any government-run marketing agency. A large private-sector food marketing company based near Toronto distributes packages of dried beans and lentils with the words "Produce of Canada" printed on the package. Some western legume farmers have used Internet communications to locate buyers, both here at home and abroad. Several farmers in British Columbia now grow varieties of fruits and vegetables that were unheard of in that region some 50 years ago. They successfully market their produce independently of any government-run marketing agency. Their business strategy has included making direct contact with the purchasing departments of large supermarket chains. Several private marketing and distribution companies also purchase produce from farmers and resell it to other large commercial buyers. There is scope for such companies to increase the variety of produce that they trade. Some people are suggesting that Canada's new majority Conservative government in Ottawa may "revise" the mandate of the Canadian Wheat Board, or even close the agency altogether. Evidence from Canada's agricultural sector shows that market savvy producers can successfully market their produce at home and abroad. 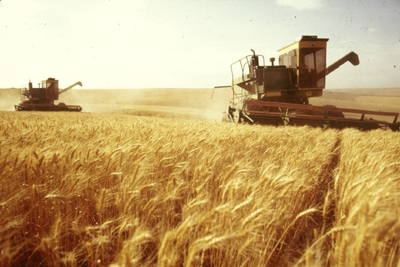 That precedent suggests that large-scale Western Canadian wheat farmers may be able to assess market demand and market their produce independently of a government marketing authority. Several such farmers have previously and privately marketed their produce. "It is not the mandate of any government to protect the market interests of inefficient and marginal producers against legitimate, free-market competition. Private farmers have already shown that certain agricultural sectors can actually flourish and succeed without government regulation, management or marketing." Privately-owned marketing and distribution companies have greatly helped bean and lentil farmers find markets for their produce. They are in a position to assist small-scale wheat farmers who have previously depended on the wheat board to purchase and resell their produce. Distributors such as the Peter Goudas group from Toronto distribute packages of whole-kernel barley and wheat to supermarkets. There may be scope for small-scale Western grain farmers to make direct contact with such food distribution companies to seek possible markets for their produce. It is not the mandate of any government to protect the market interests of inefficient and marginal producers against legitimate, free-market competition. The once mighty General Motors declared bankruptcy as a result of legitimate competition, that is, citizens choosing to buy products from other manufacturers. When government stepped in to rescue the bankrupt General Motors from liquidation and possible takeover by a competitor, it did so on the backs of actors in the rest of the economy who had to absorb the cost of such action. The market success of Western Canadian producers of fruits, vegetables, and legumes has been achieved independently of government economic planning and market regulation. Private farmers have already shown that certain agricultural sectors can actually flourish and succeed without government regulation, management or marketing. The possible absence of a government-run Canadian Wheat Board would require wheat growers to follow the lead of farmers who produce other kinds of produce. There is scope for one or more private companies to replace the wheat board and possibly purchase their storage installations and transportation equipment. Many sectors of the Canadian economy are presently subject to some form of government regulation, management, or control. Any attempt by government to encourage greater market freedom must include an end to economic regulation. While such regulation may purport to achieve some politically noble purpose, such objectives may occur over the short term only with a very different result occurring over the long term. Successful deregulation can only be achieved through the closure of marketing agencies, tribunals, or marketing boards. While the possible closure may be a good start in government getting out of the way, the performance of many other sectors of Canada's economy are also restrained by long-outdated and obsolete economic regulations.